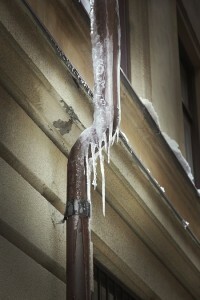 ‘Tis the season for…Freezing Pipes and Ice Dams. The first day of winter is not even here yet (less than a week away: December 21st) and the temperature has already dropped below freezing on a couple occasions. Are you ready for the cold? More importantly, is your home ready for the cold? Cold weather can wreak havoc on your home if you allow it. That is why it always pays to be prepared. And TriStar Electric can help. Heat Tape: Heat tape should be placed in gutters, around exterior water pipes, under decks, and inside garages to help keep these areas from freezing and damaging your home. Garage Heaters: Are you tired of hopping in a freezing cold car every morning? Your car heater doesn’t seem to warm you up until you are almost to work. Fortunately there is a solution: a garage heater. A 5000 watt ceiling or wall mount heater can do wonders, cutting the chill inside your garage and car. Attic Fan: “Ice damming can be a problem this time of year,” explained TriStar Electric owner Dave Crawford. “Tristar can install an attic fan to help.” Most people think attic fans are only useful to cool the attic in the summertime. However, turning an attic fan on during the winter can help slow melting, a major reason for ice dams. When ice and snow melt too fast and refreeze at the roof’s edge it creates an ice dam. This blocks the flow of melted ice and snow. With nowhere else to go, the water backs up under your shingles and into your home. Call TriStar electric for a free home safety inspection during the holiday season or anytime of the year. It only takes about 30 minutes! If you have any questions about our blog, “Freeze Warning: Freezing Pipes, Ice Dams, and Warm Hearted Remedies,” please contact TriStar Electric, Maryland’s premier residential and commercial electrician, by calling 410-799-5791 or 301-384-8880 or fill out the contact form on our website. You can also follow TriStar Electric on Facebook, Twitter, Google+, LinkedIn, Pinterest, and YouTube. This entry was posted on Wednesday, December 18th, 2013 at 6:27 pm. Both comments and pings are currently closed.